Sign Up for free to save time shopping Jetty Extracts's wholesale products on LeafLink. "We believe cannabis elevates our experiences." 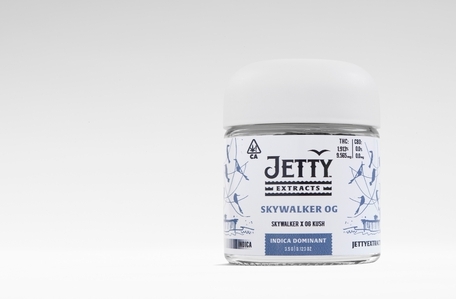 Jetty Extracts offers clean, simple, and cutting-edge ways to consume pure, potent cannabis extracts. 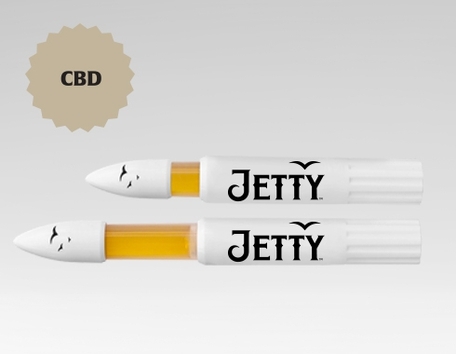 In 2013, Jetty introduced one of the first cannabis vaporizer pens to California's medical market. 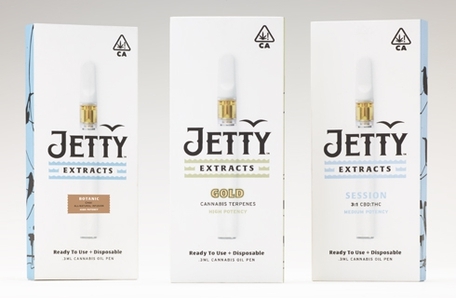 Today, Jetty Extracts offers a wide range of products including signature gold distillates for vape pen cartridges and PAX Era Pods and the Dablicator™. Every batch of oil undergoes multiple-stage testing to industry standards and is produced in a professional lab environment with premium equipment. All packaging is CA compliant. Just like Jetty Gold, Botanic starts with hand-selected cannabis sourced from sun-grown farms. The triple-distilled THC oil is mixed with all-natural flavors to create proprietary, high-potency infusions with distinctive notes of citrus, herbs, and spices. 500mg CCELL™ cartridge with wood tip for 510 thread battery. Available in 3 all-natural flavors: Orange Peel Anise, Vanilla Chamomile, and Chai. Ready to use and disposable. 0.3ML strain-specific Jetty oil in CCELL™ cartridge with battery. Jetty Extracts Flower 3.5G in a variety of strains. The upshot: maximum head and body high. A drop in your tea. Maybe a little to punch-up a preroll. However you use it, the Jetty Dablicator™ is a better way to dispense oil. The Dablicator™ is a compact device filled with our finest cannabis wax concentrate. Simply twist and click to apply precise doses, measured in 0.05 g increments. No mess, no scary-looking syringes like in the old days. It's a better way to dab too, thanks to its heat-resistant metal tip. The takeaway: versatility and convenience with your choice of high-quality strains. 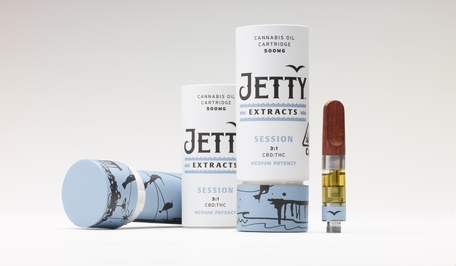 Get Jetty Extracts high-CBD cannabis oil with our much-loved direct-dabbing apparatus. The simple twist and click application offers a safe, convenient method for consuming cannabis. The Dablicator™ CBD is filled with 0.5g of our high-quality, hand-crafted cannabis distillate blended with strain-specific cannabis terpenes. A triple-distilled and all natural 3:1 CBD to THC blend. Full-flavored and complex with medium potency, like a great Session IPA. As with all Jetty products, Session contains no byproducts, particulates, pesticides or additives. CCELL™ cartridge with signature wood tip for use with 510 thread battery. NEW Jetty Extracts logo 510 thread battery for vape pen setup. (Heats the Jetty CCELL™ cartridges perfectly!) Buttonless, 350mAh, comes with USB charger. Available in two colors: white and charcoal.